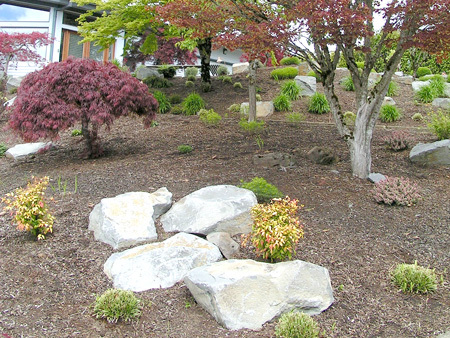 Have you considered adding boulders and rock in your landscape? 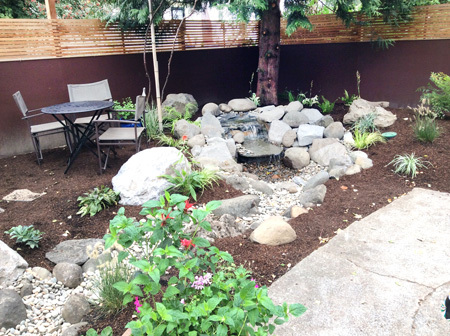 Natural boulder settings can be a beautiful accent to your yard as well as a necessary part of a landscape. The use of stone in your landscape creates a natural feel or a dramatic interest and can also add a mountain type atmosphere . Its beauty and functions are often overlooked. Stones partner naturally with foliage and water. They may also stand as other elements in the landscape, such as water. 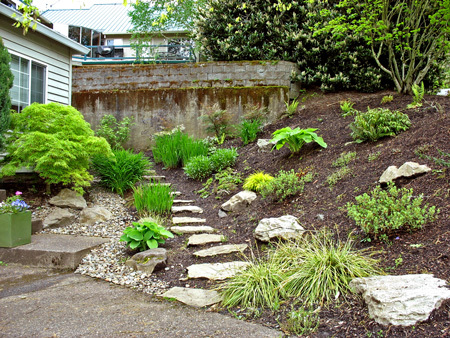 Do you have a steep slope in the area you wish to landscape? 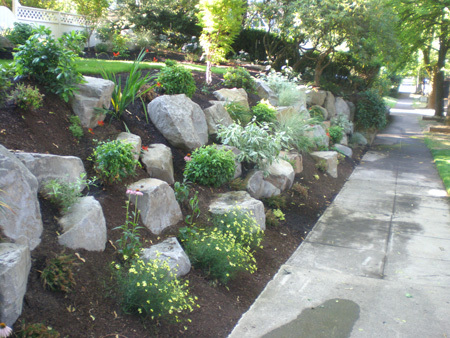 Boulders mixed with plantings can substitute for a retaining wall and can retain slopes in a way much more naturally ornamental than a wall. The interspersed shrub plantings seem to find a natural home nestled between the boulders. Boulders can be spaced close together or far apart depending on the look you want. 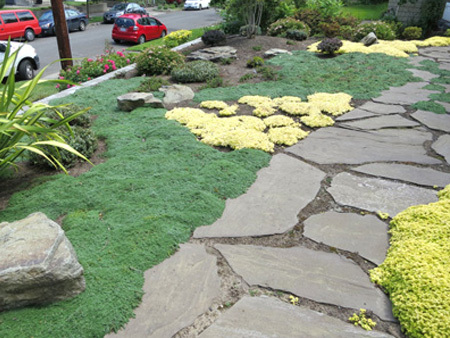 Plants can be placed to partially obscure the boulders or they can be left uncovered and totally exposed. You might add boulders and rock to your the landscape as a dry stream beds. The first photo is a pondless waterfall that appears to by supplying a stream bed. 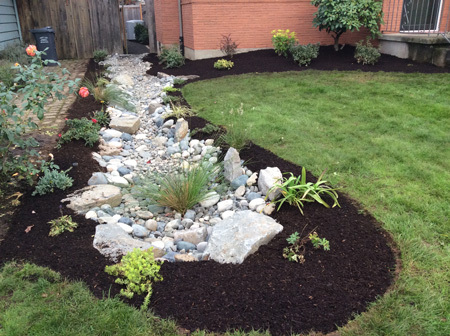 The second is a functioning rain garden that is connected to the downspouts of the home to reduce overflow in our storm sewers and rivers. 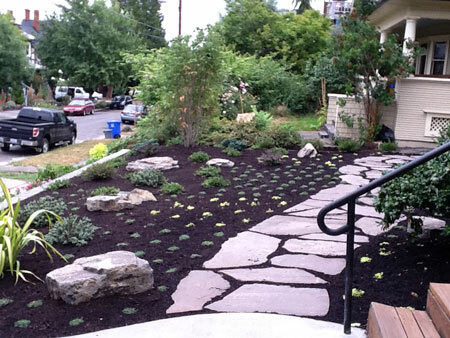 We don’t just throw rocks and plants any old way in your landscape. Rather, we combine design principles with artistic expression to achieve an effect that pleases the eye. 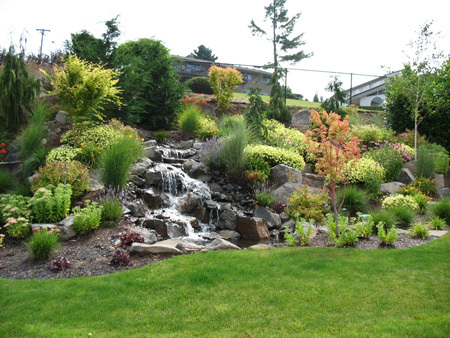 The mix and placement of plants and trees with rocks and boulders is crucial. So boulders have many uses in the Oregon landscape. Whether as accents or focal points, rock helps to connect the landscape to its surroundings, blending together our wonderful outdoors and our living spaces.